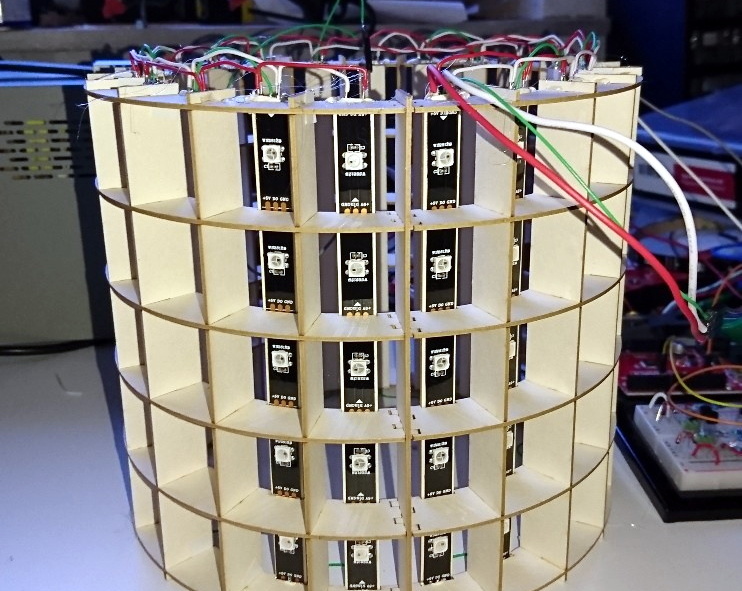 According to [makeTVee], his latest project started out as an experiment to see how well the LED matrix techniques he’s worked with in the past would translate to a cylindrical form factor. We’re going to go ahead and say that not only was the test a success, but that the concept definitely holds promise for displays that are both functional and aesthetically pleasing. This build stops a bit short of being a complete implementation, but what he has so far is very promising and we hope he continues fleshing it out. A laser cutter was used to create the interlocking segments that make up the display’s frame, but we imagine you could pull off a similar design using 3D printed parts if you don’t have access to a laser. Strips of WS2812 LEDs are mounted along the inside of the cylinder so that each individual LED lines up with the center of a cell. To finish off the outside of the cylinder [makeTVee] used a thin wood veneer called MicroWOOD, which gives the LEDs a nice diffused glow. The wood grain in the veneer also provides an organic touch that keeps the whole thing from looking too sterile. Of course, a display like this only works if you’ve got software to drive it. To that end, [makeTVee] has used pygame to create a simulator on his computer that shows what the display would look like if it were unrolled and flattened it out. This makes it a lot easier to create content, as you can see the whole display at once. He says the source for the new tool will be coming to GitHub soon, and we’re very interested in taking a look. If this display looks familiar, it’s probably because a distinctly flatter version of it took the top spot in our “Visualize it with Pi” contest last year. What’s the buzz in the hackersphere this week? Hackaday Editors Elliot Williams and Mike Szczys recap their favorite hacks and articles from the past seven days. In Episode Six we cover an incredible reverse engineering effort Mike Harrison put in with iPod nano replacement screens. We dip our toes in the radioactive world of deep-space power sources, spend some time adoring parts and partsmakers, and take a very high-brow look at toilet-seat technology. In our quickfire hacks we discuss coherent sound (think of it as akin to laminar flow, but for audio), minimal IDEs for embedded, hand-tools for metalwork, and the little ESP32 bot that could. Who doesn’t like Star Wars, LEDs, and music? [Stathack] was looking for a unique piece of art to put in his living room… so he decided to make his own Vader EQ. The EQ is a massive 4′ x 5′ piece made from plywood and MDF. [Stathack] traced the familiar helmet onto it by using a projector to project the outline onto the surface. Not having access to an extra large CNC or laser, he then painstakingly used a jigsaw to cut out all the white pieces of the design — holy cow. This process only took weeks and weeks of sanding, filling and sanding again due to the excellent precision of a jigsaw. Once that was all done, he created the backing plate out of MDF to provide structural support and mounting locations for the LEDs. Bit of spray paint later and a simple circuit with the Arduino and it’s both done, and awesome. What happens when you take over 800 individually addressable super bright RGB LEDs and house them in a giant diffused panel? You get awesome. That’s what you get. [Epoch Rises] is a small electronic music and interactive technology duo who create cool interactive projects (like this wall) for their live shows and performances. They love their WS2812B LEDs. The cool thing about this wall is that it can take any video input, it can be controlled by sound or music, an iPad, or even generate random imagery by itself. The 800 LEDs are controlled by a Teensy 3.0 using the OctoWS2811 library from Paul Stoffregen which is capable of driving over 1000 LEDs at a whopping 30FPS using just one Teensy microcontroller. It works by using Direct Memory Access to send data over serial into the Teensy’s memory and directly out to the LEDs with very little overhead — it is a Teensy after all!